How do we approach ‘big data’ critically? What is to be done with ‘big data’? As the public discourse around data turns from hubristic claims to existing, empirical results, it’s become nearly as easy to bash ‘big data’ as to hype it (Carr 2014; Marcus and Davis 2014; Harford 2014; Podesta 2014). Geographers are intimately involved with this recent rise of data. Most digital information now contains some spatial component (Hahmann and Burghardt 2013) and geographers are contributing tools (Haklay and Weber 2008), maps (Zook and Poorthius 2014), and methods (Tsou et al. 2014) to the rising tide of quantification. Critiques of ‘big data’ thus far offer keen insight and acerbic wit, but remain piecemeal and disconnected. ‘Big data’s’ successes or failures as a tool are judged (K.N.C. 2014), or it is examined from a specific perspective, such as its role in surveillance (Crampton et al. 2014). 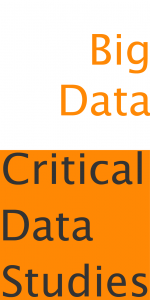 Recently, voices in critical geography have raised the call for a systemic approach to data criticisms, a critical data studies (Dalton and Thatcher 2014; Graham 2014; Kitchin 2014). This post presents seven key provocations we see as drivers of a comprehensive critique of the new regimes of data, ‘big’ or not. We focus on why a critical approach is needed, what it may offer, and some idea of what it could look like.